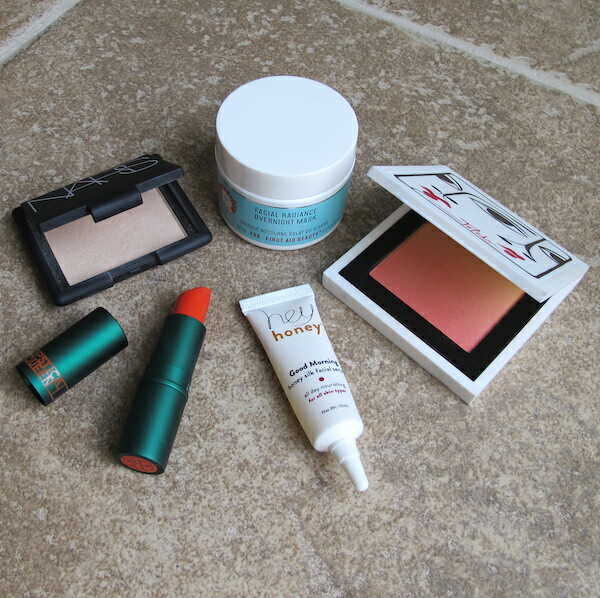 It’s been a while since I’ve done a monthly favorites post, and with spring here and summer right around the corner, I’ve been making lots of changes in my routine. Here are my 5 loves, some new and some rekindled, for April! First Aid Beauty Facial Radiance Overnight Mask-I started wearing this as my nightly moisturizer about a year and a half ago, and haven’t looked back since. While it is just a tad sticky, it really leaves my face feeling smooth and refreshed in the morning. I stopped using it over the winter because it didn’t moisturize as much as I needed it to, but now that the dry, freezing weather is a thing of the past, I’ve fallen in love with it all over again. MAC Isabel & Ruben Toledo Blush Ombre in Ripe Peach-Boy am I glad I managed to get a hold of one of these before they sold out. I think it goes without saying that the design on the case is freaking adorable. As far as the actual blush goes, you know I love my peaches. This is just that, with a touch of pink. It’s not very pigmented, but I actually prefer blushes that aren’t because I can keep layering until I get it the way I want instead of accidentally going overboard on the first swipe (fair skinned lady problems). It’s mostly matte with a tiny bit of sheen for a subtle glow. Lipstick Queen Jungle Queen Lipstick-This lipstick kind of scared me when I purchased it a year ago. I wanted to like it, but it was so bold compared to my usual lipsticks that I wasn’t feeling 100% confident wearing it. This spring, however, I have been all about it. It’s a semi-sheer, bright coral that can instantly add a colorful pop to any basic look and make it more lively. The formula is slick and hydrating and it lasts for a relatively long time-unless you’re doing a lot of eating or drinking. I’ll definitely be wearing this one through the summer because it’s so fun. NARS Blush in Nico-My new holy grail. I bought this with the intention of using it as a highlighter, but since it is practically invisible on my skin, I had to find another use for it or be sad that I spent $30 on a product I wasn’t going to use. I started using it as a finishing powder, and it’s better than anything I’ve ever used. It brightens and softens the look of my face and leaves a gorgeous glow that other finishing powders I’ve tried just can’t compete with. Hey Honey Good Morning Honey Silk Facial Serum-I got this in my April Ipsy Bag and my skin has completely transformed since using it. The red, uneven tone has faded considerably, and my skin is smoother than ever. My complexion is bright and glowing, which will be perfect for hitting up the beach makeup-free this summer.